Amazing Kong & La Rosa Negra vs Sampson & Social at BLOW, SHINE 12 Results: Rain retains, Von Eerie turns heel?, WWE Divas & TNA Knockouts: Brooke Hogan Fired + So Cal Val, AJ Lee's big week, Total Divas, Tessmacher's heel turn, Joshi News: Ice Ribbon, WAVE, REINA & STARDOM Results, Kaori Yoneyama, Kana vs Manami Katsu on 9/16, SMASH Wrestling CANUSA, More names added to GNO 9-10, Four competitors announced for SHIMMER, Xtreme Bombshells of Wrestling, Upcoming events & More. Follow me @Ciara92189 and @FightSeason on Twitter. Angrymarkette Newsfeed is dedicated to highlighting the news surrounding women's wrestling throughout the world, from Joshi Puroresu in Japan to USA to Lucha Libre in Mexico. ►Missy Sampson and Annie Social, The Backseat Girlz will face current Pro Wrestling Syndicate Bombshells Champion La Rosa Negra and a partner of Bombshells Commissioner Vinny Finucci selection at the next Bombshell Ladies of Wrestling event is scheduled for September 28th in Iselin, New Jersey. Rosa Negra's mystery partner has been revealed as Amazing Kong. "Primetime" Amy Lee will be making her return against Sumie Sakai. Angelina Love takes on former Womens of Wrestling competitor Riot in her first wrestling appearance in over a decade. Jennifer Cruz will battle Amber Rodriguez. Luscious Latasha makes her return against the debuting Vanity. Veda Scott and Mistress Belmont, going by "Freaks & Geeks" will be taking on S.I.N's Alexxis Nevaeh and Jessie Kaye. And Silvie Silver and Lucifer Darkside will take on Craig Steele and Amber. ►Two matches have been announced for Women Superstars Uncensored's "Blood And Thunder" on October 12th in Voorhees, New Jersey, The WSU Championship will be on the line as Jessicka Havok defends against Lexxus, WSU noted that due to "The Wrestling Goddess" Athena's injury at the "secret show" she was forced to forfeit her contendership to the title. That being said Lexxus will have her opportunity to take on Havok for the title, being that she is the current number one contender. Also, Jenny Rose will face Pro Wrestling:EVE's Champion Nikki Storm for the first time. ►Kimber Lee takes on Nevaeh at Combat Zone Wrestling's "Deja Vu" on September 7th. ►On September 15th, SMASH Wrestling will be holding their one-night international tournament that will competitors from the United States pitted against Canadian grapplers, the "CANUSA Classic." Representing Canada will be LuFisto, Vanessa Kraven, Seleziya Sparx, Courtney Rush and Xandra Bale, while Candice LaRae, Christina Von Eerie, Veda Scott, Chrissy Rivera and Kimber Lee will be repping the U.S. The first round matches for the one-night tournament have been announced, Vanessa Kraven takes on Chrissy Rivera, Xandra Bale takes on Kimber Lee, Seleziya Sparx takes on Veda Scott, Courtney Rush takes on Candice LaRae and LuFisto goes up against Christina Von Eerie. ►Four competitors have been announced for SHIMMER Women Athletes' Volumes 58-61 tapings on the weekend of October 19-20th. SHIMMER Champion Cheerleader Melissa, Madison Eagles and the current SHIMMER Tag Team Champions Tomoka Nakagawa and "The Rate Tank" Kellie Skater, known as 3G. ►Melanie Cruise takes on "Crazy" Mary Dobson at Evolution Pro Wrestling on September 19th. ►Xandra Bale, Jodi D'Milo, Angel Dust, Jasmin and The Social Network compiled of Annie Social, Heidi Lovelace, Nikki St. John and Sammy Geodollno are the latest competitors confirmed for Absolute Intense Wrestling's "Girls Night Out 9-10" on October 6th. Jasmin and Xandra Bale will be making their debuts for the franchise, while Angel Dust and The Social Network will be making their return and possibly settle the score once and for all. ►The third annual Vendetta Vixens Battle Royal for the Luna Vachon Memorial Lunacy Cup will take place at Vendetta Pro Wrestling's "September 2 Remember" on Setember 13th in Santa Maria, California. Shelly Martinez, Gold Digger, Terra Calaway, Mariah Moreno, Brittany Wonder, Nicole Matthias, Raze, Heather Lynn and Michelle Calder are the competitors in Battle Royal. ►Family Wrestling Entertainment will be holding an Open Ivitational Tournament on October 12th to determine not one, but two number one contenders to Maria Kanellis' FWE Women's Championship. The tournament will consist of at least ten competitors that have accepted the challenge. Angelina Love, Katarina Leigh, Thea Trinidad and Ivelisse are the first four competitors to have thrown their hat into the tournament. Serena Deeb and Kasey Ray have been announced as well. ►SHINE Wrestling presented "SHINE 12" on WWNLive.com on Friday night, broadcasting from Ybor City, Florida. With little announcements of "big" matches for the card, it was clear that SHINE was in reset mode coming off their one year anniversary IPPV last month. Back on July 12th "SHINE 11," the first ever SHINE Champion was crowned in Rain, as she defeated LuFisto, Jessicka Havok(though evidence suggests Rain paid "Sweet" Saraya Knight to ambush Havok before their match)and Mia Yim in the tournament to become the premier champion. SHINE 12 would feature Leva Bates taking on Christina Von Eerie, the debut of "Portugal's Perfect Athlete" Shanna against Angelina Love, Mercedes Martinez going toe to toe with Amazing Kong, coupled with the returns of Brandi Wine going up against Santana Garrett, Kimber Lee taking on Kimberly and The West Coast Connection, comprised of Su Yung and Tracy Taylor against Daffney's A.(All)S. (Star)S(Squad) Nikki Roxx and Solo Darling in their first showing and there would be a three-way match between Jessicka Havok, Mia Yim and Ivelisse to determine the number one contender to the SHINE Championship with the winner taking on Rain for the title later that night. Despite Rain's refusal to defend the title as SHINE had no contender to challenge for the title, SHINE Vice President Lexie Fyfe along with SHINE officials decided that the next challenger will be determined by the later three competitors from the tournament, as Havok and Ivelisse were semi finalists while Yim was in the finals. Daffney's All Star Squad kicked off the show picking up a win over the West Coast Connection when Roxx got the Barbie Crusher on Yung. Next, Leva Bates defeated Christina Von Eerie via disqualification as Von Eerie struck Bates with a chair. Next, Kimberly submitted Kimber Lee to the Cloverleaf. Jessicka Havok got the Demon Drop on Ivelisse in the three-way involving Mia Yim. The rematch between Von Eerie and Bates ended in another disqualification as Von Eerie struck the referee. Santana Garrett versus Brandi Wine turned into an impromptu tag team match as both competitors had their partners at ringside. Santana Garrett and Amber O'Neal defeated Brandi Wine and Malia Hosaka whn Garrett got the Shining Star Press on Wine. Amazing Kong defeated Mercedes Martinez following an Implant Buster and Angelina Love got the Botox Injection on Shanna. And in the main event, Rain successfully retained the SHINE Championship against Jessicka Havok. Rain continuously targeted her towards Havok's injured knee, causing Havok's knee to buckle after she caught Rain on a cross body. As Havok's knee buckled, rain ceased the opportunity and covered her with April Hunter providing leverage from the outside. Ivelisse and Rain continue to dish out the punishment on Havok post match, with Rain crushing Havok's leg with a steel chair. Amazing Kong chased Ivelisse away as Angelina Love laid out the champion with the Botox Injection. Love then stood over the fallen champion with the SHINE Championship in hand signifying that she is next in line for the title. Thoughts-Coming off a big event in July, SHINE Wrestling's approach to booking for this show focused on initiating new rivalries, introducing new personas and setting up Rain's first title defense. Everything looked to be in reset mode. First, Christina Von Eerie made a heel turn. Last appearing at "SHINE 8" on the losing end of an eight-person tag team match to The Valkyrie, Von Eerie's "accidental" switch was pulled at the conclusion of Su Yung's match as Von Eerie attacked her. Von Eerie then gets disqualified from her match against Leva Bates after a chairshot outside the ring. Bates and Von Eerie would wrestle again, this time with Von Eerie proclaiming that she did not intend for their match to end that way. Their rematch would end in another disqualification as Von Eerie refused to abide the referee's commands and shoved him a couple of times. Is Christina Von Eerie a heel or was the switch an accident?-Von Eerie's attack of Su Yung was intended to carry over their program in Dragon Gate USA into the promotion as Yung attacked Von Eerie with her shoe, but instead left it's audience perplexed. Yung tried to get revenge on Von Eerie, but was held back by Tracy Taylor. The attempt to crossover storylines from other promotions into SHINE failed, as SHINE did not provide coverage of Von Eerie and Yung's spat on the site days leading up to SHINE 12, instead Von Eerie is a heel with no clear definitive explanation. The match between Mercedes Martinez and Amazing Kong felt filler. Their feud has been long over with and it just did not make much sense to have the two mixed together again, at this point both competitors need a steady rival. The same goes for Kimberly. It looks that SHINE is working towards establishing an in depth tag team division, Made In Sin, Solo Darling and Nikki Roxx, O'Neal and Garrett, Hosaka and Wine and the West Coast Connection currently make up the division. Its understandable as the SHIMMER Tag Team Championship will need fresh contenders going into future tapings. Rain's next title defense as SHINE Champion will be on September 27th against Angelina Love, Rain also noted on Twitter that she has three final wrestling dates for SHINE as she will be wrapping up in December to retire. The roster for "SHINE 13" has been announced, Mercedes Martinez, Amazing Kong, Santana Garrett, Su Yung, Amber O'Neal, Kimberly, Leva Bates, Mia Yim, Jessicka Havok, Daffney's A.S.S, the returns of Taeler Hendrix, Leah Von Dutch, Jessie Belle, Made In Sin's Allysin Kay as her suspension will be up and Taylor Made, Sassy Stephie and the debuts of Xandra Bale, Nevaeh and Nikki Storm. ►Brittney Savage has officially retired from writing and has a "tell all" book possibly in the works. ►Tsukasa Fujimoto made her first title defense of the ICEx∞ Championship against Manami Toyota on Sunday. Back on July 14th,Fujimoto nominated Toyota as next challenger to the promptly renamed ICE Cross Infinity Title as Toyota would be the first competitor to challenge for the title since the abolishment of the weight criteria for the title. Fujimoto finished Toyota with Toyota's trademarked Japanese Ocean Queen Bee Bomb twice to seal the deal. Also, Ayako Hamada defeated Tsukushi with the Moonsault. Maki Narumiya made her return, picking up a loss to Neko Nitta. Mio Shirai and Rutsuko Yamaguchi defeated Cherry & Meari Naito in the finals of the International Ribbon Tag Team Championship Challenger League as Yamaguchi used an Axe Kick on Naito. And Hikaru Shida, Syuri, Hanako Nakamori and Misaki Ohata defeated Aoi Kizuki, Makoto, Arisa Nakajima and Sawako Shimono in a Our Time Match when Shida used a Three Count of the Soul on Shimono. Leon and Raideen Hagane and Vaquerita and CMLL-REINA Junior Champion Zeuxis have advanced in the first round of the REINA World Tag Team Championship Tournament, going over Risa Sera and Kasey Owens and Miyako Matsumoto and Makoto respectively. The two teams will meet in a decision match, but the date for the match has yet to be confirmed. The teams for the Pro Wrestling WAVE's Dual Shock WAVE Tag League, which will begin on September 1st and conclude on October 6th with the winners earning a shot at the WAVE Tag Team Championships, that are now in possession of Cherry and Shu Shibutani. The teams of Ayako Hamada and Yuu Yamagata, Tsukasa Fujimoto and Hikaru Shida, current WAVE Tag Team Champions Shu Shibutani and Cherry, Hamuko Hoshi and Sawako Shimono, GAMI and Ryo Mizunami, Mio Shirai and Misaki Ohata and Yumi Ohka and Kana will face off in a round-robin styled tournament, draws and losses equates to no points, if a team loses or draws three matches, they're disqualified. The winners will face Shibutani and Cherry for the belts on October 30th, but if the champions win the 2013 Dual Shock WAVE, the runner ups will get the shot. Also, Yumi Ohka retained her Regina di WAVE Championshipagainst 2013 Catch the WAVE Winner Misaki Ohata, hitting the Big Boot for her second title defense. Day one of the 5*STAR Grand Prix kicked off on Sunday, hosting 285 in attendance. World of Stardom Champion Io Shirai and Wonder of Stardom Champion "Dark Angel" Sarah Stock lead the the Red Stars with two points individually, as they conquered their opponents Kairi Hojo with the La Reienera and Kaori Yoneyama with the patented Moonsault Footstomp. Act Yasukawa and Yuhi lead the Blue Stars with two points, going over Natsuki*Taiyo with the Honey Trap and Kyoko Kimura with a small package. There were two contests that exceeded the time limit, Alpha Female-Takumi Iroha and Nanae Takahashi-Yoshiko went to a time limit draw, nonsensical booking for two matches to draw in a tournament nonetheless. As a result of the booking, all four participants have gained a point each in their standings, while the losers have none. Usually dont complain much about STARDOM's booking, but there should have been a clear decision in one of the contests, especially the contest involving Alpha Female as reports indicated that she had continuously dominated Iroha through out. As a tidbit, Takahashi and Alpha Female are both former World of Stardom Champions, as Takahashi was the most successful thus far, one would ponder that the former champions would predictable shoo-ins for making light work of their opponents. More STARDOM, Io Shirai retained again. Shirai defeated Kyoko Kimura in the main event of the August 17th show at the Korakuen Hall. The Artist of STARDOM Titles were on the line as Yuhi, Kairi Hojo and Kaori Yoneyama were successful in their first defense against the two-thirds of the inuagural champion Natsuki*Taiyo and Act Yasukawa along with Yoshiko, Hojo got the Sliding D on Yasukawa for the pinfall. Tables would turn as Act Yasukawa turned on her Trouble Maker 2 stablemates, laying out Yoshiko with a steel chair to join forces with Kyoko Kimura's Monster-gun. Did I include that Alpha Female's contest against Hiroyo Matsumoto went to a time limit draw as well, see the frustration. Dynamite Kansai, Azumi Hyuga, Manami Toyota, Hailey Hatred, Kayoko Haruyama and Arisa Nakajima all have fell victim to the dasterdly three. Last Sunday in Tokyo, Japan, Arisa Nakajima dropped the JWP Openweight Championship to "The World Famous" Kana in a highly anticipated match at JWP's annual "Pure-Slam." In the main event at the Korakuen Hall, Kana knocked out Nakajima with the Dojime Chickenwing Sleeper. Kana's first title defense as JWP Openweight Champion will be against Manami Katsu on September 16th at the Itabashi Green Hall. Katsu challenged to a title match, with Kana accepting. Katsu recently successfully retained her JWP Junior & POP Championship against Eri Susa with the Inazuma Buster, as Susa was the finalist of the JWP Jr. & Pop Next Challenger League. Also, the JWP & Daily Sports Women's Tag Team Championships changed hands as Morii and Hanako Nakamori defeated Tsubasa Kuragaki and Kayoko Haruyama. Morii ended the match with the Falcon Arrow Cutback on Kuragaki. As if the momentous occasion couldnt have been dampened, Morii has suffered a fractured wrist and is out indefinitely with no further update on her return. In addition, Kuragaki has announced that come October 14th she will be leaving the promotion to become a freelance competitor. It was announced at the recent JWP press conference that Kuragaki will be taking bookings outside the JWP banner, though she is a regular in Oz Academy and Pro Wrestling WAVE, Kuragaki has spent fifteen of her eighteen year career wrestling on the JWP canvas. Kuragaki has stated that she wants her final match as a JWP competitor to be against Kayoko Haruyama. The October 14th event will be commemoration event for Kuragaki's fifteenth anniversary. ►Talk about being "worked." AJ Lee dropped some "pipe bombs" on Monday Night RAW. The WWE Divas Champion made her presence at the conclusion of the match up between Brie Bella and Natalya to deliver a message to all the Total Divas with some "truth" as well. Lee ran down the likes of Natalya, the Funkadactyls, Joseann Offerman, Eva Marie and the Bellas, citing that neither woman could lace up her Chuck Taylors and duplicate what she has managed to do within a year's span, as its taken their entire career to achieve that success. "Do you want to know what I see when I look in that ring? Honestly? A bunch of cheap, interchangeable, expendable, useless women. Women who have turned to reality television who just weren’t gifted enough to be actresses. And they just weren’t talented enough to be champions. I have done more in one year than all of you have done in your entire collective careers. I have saved your Diva’s division. I have shattered glass ceilings. I have broken down doors. Why? So a bunch of ungrateful, stiff plastic mannequins can waltz on through with as much as a “thank you”? You guys can’t even go backstage and shake my hand and look me in the eye, because you know that I worked my entire life to be here. I gave my life to this and you were just handed fifteen minutes of fame. I didn’t get here because I was cute or because I came from some famous wrestling family or because I sucked up to the right people. I got here because I am good. I earned this championship. And no matter how many red carpets you guys want to walk in your four thousand dollar ridiculous heels, you will never be able to lace up my Chuck Taylors. You are all worthless excuses for women and you will never be able to touch me. And that is reality." social media about the aforementioned Divas as AJ Lee was speaking the "gospel" about the always scrutinized Divas division. Irregardless of the ball of negativity towards Total Divas, the show has benefited the Divas involved as all women, including Eva Marie and Joseann Offerman are seen on television every week and not just any of WWE's many shows, but the bigger show, being Monday Night RAW. Whether the consistent matches from week to week involving Natalya and Brie Bella is to promote the show or not, it provides the audience with a consistent program within the Divas division that has been yearned for a long time. AJ Lee's spoken truth will be featured on an upcoming episode of Total Divas, as the storyline of Lee putting her Divas Championship on the line at Night of Champions against a Total Diva will be apart of filming. Whether the promo was to invoke interest in the upcoming program, it was obvious that it was intended for filming as Lee brought up everything that happened on Sunday's episode, including the strained relationship with Nikki Bella and her father to ruffle some feathers and to of course have the Divas providing "smack" talk in confessionals on Lee's comments. Total Divas shows the Divas competiting in matches and an explanation for the match, so its obvious this will be a huge part of the final episodes of this season. Ahead of her segment on RAW, AJ Lee picked up another title defense last week, conquering the wide-eyed, lacks people skills Bayley on NXT last week. The week prior in a backstage segment, Bayley locked in a "breath taking" hug on Lee and continuously held onto the champion as she wants to be friends. A bit Naive, the match starts off with AJ Lee initiating a hug for Bayley to be confused at first. As Bayley went for a hug, Lee shoved her down to the mat. Throughout the match Bayley continued to work on the champion, but would go for a hug at the site of pain in Lee's face. The match concluded with Bayley going for another hug for AJ Lee to hit the Shining Wizard for the three. Lee also had a great match with Naomi on Main Event to boot. Former WWE Diva Eve Torres is set to be apart of the cast for the Skorpion King 4. Eva Marie is featured in the upcoming issue of MAXIM magazine. Lexi Kaufman, Rebecca Knox, CJ Perry, Brittany Fetkin and Erika Hammond have all received their NXT names. Kaufamn is "Alexa Bliss," Erika Hammond is "Veronica Lane," Rebecca Knox is "Becky Lynch," CJ Perry is "Lana" and Fetkin is "Devin Taylor." So Cal Val and Brooke Hogan were released from TNA over the past week. Hogan, the now former VP of the Knockouts division was reportedly "fired" by TNA two weeks ago. Reports surfaced that Hogan and TNA collectively decided to part ways as her role int he company had ran it's course. But, financial decisions also played part in the decision, as Hogan was looked at as a "luxury" given her last name. So Cal Val was also a victim of TNA's cost cutting measures. After nine years in the company, So Cal Val broke the news of her departure from the company on Twitter. Unlike Hogan, Val made contributions to the product as a backstage interviewer amongst other tasks, but like Hogan she was not competitor in the ring. TNA is said to be focused on talent that is used on a consistent basis, as opposed to the flashy names that plagued the company over the years. The Knockouts division is down to Miss Tessmacher, Gail Kim, Mickie James, Vevet Sky, Taryn Terrell and ODB, three babyfaces and three heels. Speaking of heels, Miss Tessmacher, now going by "Brooke" since the aforementioned was let go, is now a heel. After a hiatus from television, Tessmacher reappeared as the new love interest of TNA World Champion Bully Ray, aligning herself with Aces 'n' Eights. Claiming to be the "hotter Brooke," this is a definite swing in a different direction for Tessmacher as her last heel run saw her as the assistant to Eric Bischoff and provided no direction in her character. Now Tessmacher is likely to fall into the background as Ray's main squeeze as opposed to be a two-time former TNA Knockouts Champion and going after Jame's title. Mickie James currently has no contendr for her championship and it looks that TNA is gunning for a program between she and ODB at some point. Taryn Terrell has been off television for the past several weeks with no explanation. Rumors swirled that she was pregnant, but that's not the case. Lisa Marie Varon, the former "Tara," says that she will "never return to TNA." Varon was released from her contract early and is focused on her growing her restaurant among other projects. ►Leah Von Dutch is the new Xtreme Bombshells of Wrestling Champion. She defeated Sojo Bolt in the decision match at the Colin Vani Benefit on Saturday, making Dutch the inaugural champion of the promotion. Also on the card, KC Lofton defeated Jasmin. Dixie Lixx defeated Reblia Duke. Jewells Malone went over Xandra Bale, Samantha won a battle royal, Silvie Silver defeated Lady Victoria and Jillian Hall defeated Xandra Bale. ►Matches for Alternative Wrestling Show's "Number Three: The Women's Tournament" on September 28th have been announced, joining the already announced non tournament contest between LuFisto and Christina Von Eerie for the AWS Women's Championship, the first round of the tournament will see Claudia del Solis take on Sierra Rose, Hudson Envy take on Lacey Ryan, Marti Daniels versus Tabitha Jackson, Kurai Hime versus Raze, Kitana Vera versus Brittany Wonder, Michele Morgan versus Katarina Leigh, Mariah Moreno take on Crystal White and Candice LeRae takes on an opponenet soon to be announced. Gold Digger and Sage Sin are also scheduled to appear. ►Current Anarchy Championship Wrestling Televised Champion and 2013 American Joshi Queen of Queens Angel Blue has announced that she will not be taking up anymore bookings for the time being. The double champion broke the news through her official Facebook, citing that she is still finishing out her current slate of bookings. Blue recently made her first successful title defense against Jack Jameson at "Distrust, Dismay & Antisocial Behavior." That same event featured Jessica James defending the ACW American Joshi Championship against Su Yung. ►Kay Lee Ray will take on Viper and Amazing Kong in three-way at Insane Championship Wrestling: Fierce Fatales's "It's In Our DNA!'' on September 22nd. ►Dallys la Caribena, Estrellita & Goya Kong def La Comandante, La Seductora & Tiffany at CMLL(August 20, 2013). ►AJ Lee(c) def Naomi on WWE's Main Event(August 21, 2013). ►AJ Lee(c) def Bayley on NXT(August 21, 2013). ►Crazy Mary Dobson def Allysin Kay at ZERO1's "NWF Challenge Night"(August 22, 2013). ►Gail Kim def ODB on Impact Wrestling(August 22, 2013). 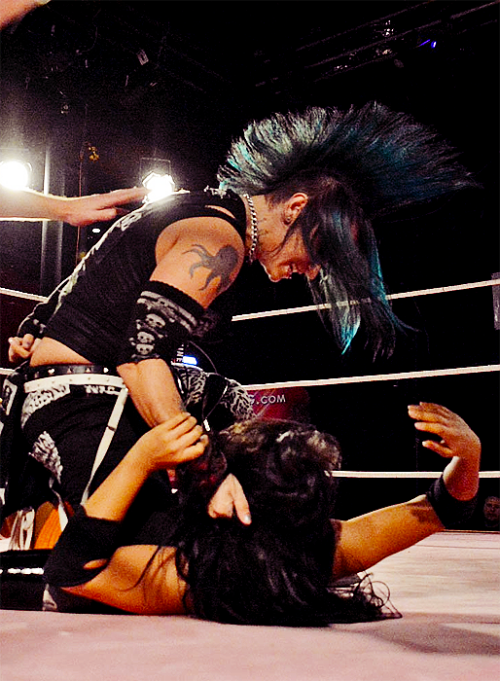 ►SHINE Wrestling's "SHINE 12"(August 23, 2013): Nikki Roxx & Solo Darling def Tracy Taylor & Su Yung /Leva Bates def Christina Von Eerie /Kimberly def Kimber Lee / Jessicka Havok def Mia Yim & Ivelisse Velez /Leva Bates def Christina Von Eerie /Santana Garrett & Amber O’Neal def Brandi Wine & Malia Hosaka / Amazing Kong def Mercedes Martinez /Angelina Love def Shanna /Rain(c) def Jessicka Havok. ►Heidi Lovelace & Ryan Boz def Heather Patera & Jordan McEntyre at AAW's "Reign Of Violence"(August 23, 2013). ►Viper def Nikki Storm at Scottish Wrestling Alliance(August 23, 2013). ►Bambi def Kana at K-DOJO(August 23, 2013). ►REINA Joshi Puroresu(August 24, 2013): Tsukushi def Kaho Kobayashi/ Zeuxis & Vaquerita def Risa Sera & Kasey Owens / Syuri def Rabbit Miu and Ariya/ Leon & Raideen Hagane def Miyako Matsumoto & Makoto / Chika Tormenta def Dump Matsumoto. ►Diana(August 24, 2013): Crazy Mary def Piyotamask / Mask de Sun & Yuiga def Kaoru Ito & Allysin Kay /Mima Shimoda & Tomoko Watanabe def Yumiko Hotta & Keiko Aono / Jaguar Yokota & Manami Toyota def Kyoko Inoue & Sareee. ►Heidi Lovelace def Portia Perez at Wrestling Is Fun's "Cruel Sommer"(August 24, 2013). ►Xtreme Bombshells of Wrestling(August 24, 2013): Jillian Hall def Xandra Bale/ Leah Von Dutch def Sojo Bolt/ Jewells Malone def Xandra Bale/ KC Lofton def Jasmin/ Dixie Lixx def Rebelia Duke/ Silvie Silver def Lady Victoria. ►Scottish Wrestling Entertainment's "Hell For Lycra X"(August 24, 2013): Viper def Bete Noire/ Grado, Sammi Jayne & Scott Renwick def Nikki Storm & The Syndicate. ►Sassy Stephie def Kacee Carlisle(c) via count out at Bruiser Wrestling Federation(August 24, 2013). ►Estrellita, Luna Mágica, Marcela def Amapola, Princesa Blanca, Princesa Sugheit via DQ at CMLL(August 25, 2013). ►Ice Ribbon(August 25, 2013): Kurumi, 235 & Kyuri def Hamuko Hoshi, Kasey Owens & Koyuki Hayashi /Kagetsu def Risa Sera / Neko Nitta def Maki Narumiya / Mio Shirai & Rutsuko Yamaguchi def Cherry & Meari Naito /Ayako Hamada def Tsukushi /Miyako Matsumoto def Survival Tobita /Hikaru Shida, Syuri, Hanako Nakamori & Misaki Ohata def Aoi Kizuki, Makoto, Arisa Nakajima & Sawako Shimono /Tsukasa Fujimoto(c) def Manami Toyota. ►Insane Championship Wrestling(August 25, 2013): Kay Lee Ray(c) def Carmel Jacob/ Nikki Storm def Leah Owens. ►STARDOM(August 25, 2013): Miho Wakizawa def Hiroyo Matsumoto and Mayu Iwatani/ Dark Angel def Kairi Hojo /Takumi Iroha vs The Alpha Female went to a time limit draw/ Act Yasukawa def Kyoko Kimura /Yuhi def Natsuki*Taiyo /Nanae Takahashi vs Yoshiko went to time limit draw /Io Shirai def Kaori Yoneyama. ►Rabbit Miu Produce(August 25, 2013): Manami Katsu & Raideen Hagane def Rabbit Miu & Yako Fujigasaki /KAZUKI def Arisa Nakajima /Command Bolshoi, Hanako Nakamori & Rabbit Miu def Kayoko Haruyama, Tsubasa Kuragaki & Leon. ►Pro Wrestling WAVE(August 25, 2013): Sawako Shimono & Tsukushi def Kagetsu & Kaho Kobayashi /Gori-ko def Sakura Hirota /Moeka Haruhi def Fairy Nipponbashi /Kyoko Kimura def Ryo Mizunami / Ayako Hamada & Yuu Yamagata def Kana & Mio Shirai /Shu Shibutani & Cherry def GAMI & Tomoka Nakagawa(c)/ Yumi Ohka(c) def Misaki Ohata. ►Nevaeh def Sassy Stephie at International Wrestling Cartel's "Mountain State Madness 5"(August 25, 2013). ►Brie Bella def Natalya on Monday Night RAW(August 26, 2013). ►Sendai Girls on September 6th: Leon vs Raideen Hagane/Sakura Hirota vs Eiger vs Mio Shirai/ Meiko Satomura & Sareee vs Carlos Amano & Allysin Kay/ Kagetsu vs Manami Toyota /DASH Chisako & Sendai Sachiko vs Hiroyo Matsumoto & Manami Katsu. ►Jodi D'Milo vs Courtney Rush atMax Pro North's "Anarchy in Angus 11" on September 7th. ►Kimber Lee vs Nevaeh at Combat Zone Wrestling's "Deja Vu" on September 7th. ►D’Arcy Dixon(c) & Thunderkitty vs Mickie Knuckles & Nikki St John at RESISTANCE Pro's "ALIVE" on September 7th. ►Vendetta Pro Wrestling's "September 2 Remember" on Setember 13th: Shelly Martinez, Gold Digger, Terra Calaway, Mariah Moreno, Brittany Wonder, Nicole Matthias, Raze, Heather Lynn, Michelle Calder. ►Oz Academy on September 15th: AKNIO(c) vs Ayako Hamada/ Sonoko Kato vs Meiko Satomura/ Dynamite Kansai, Yumiko Hotta & Takako Inoue vs Manami Toyota, Mima Shimoda & Kyoko Inoue/ Chikayo Nagashima vs Mayumi Ozaki/ Carlos Amano vs Kana. ►SMASH Wrestling's "CANUASA Classic" on September 15th: Vanessa Kraven vs Chrissy Rivera/ Xandra Bale vs Kimber Lee/ Seleziya Sparx vs Veda Scott / Courtney Rush vs Candice LaRae/ LuFisto vs Christina Von Eerie. ►Kaori Yoneyama's Produce on September 16th: Kaori Yoneyama & Emi Sakura vs Natsuki*Taiyo & Kotori/ Aki Kamibayashi vs Sayaka Obihiro/ Kyoko Kimura vs TBA/ Cherry & Choun-Shiryu vs Riho & TBD. ►Insane Championship Wrestling's Fierce Fatales: "It's In Our DNA!" on September 22nd: Kay Lee Ray(c) vs Vyper/ Carmel Jacob vs Crazy Mary Dobson/ Portia Perez vs Nikki Storm/ Amazing Kong. ►SHINE Wrestling's "SHINE 13" on September 27th: Rain(c) vs Angelina Love/Xandra Bale, Nikki Storm, Taeler Hendrix, Alexxis Nevaeh, Leah Von Dutch, Made In Sin, Amazing Kong, Santana Garrett, Kimberly, Amber O'Neal, Su Yung, Sassy Stephie, Mia Yim, Jessie Belle, Jessicka Havok, Mercedes Martinez, Leva Bates, Nikki Roxx, Solo Darling. ►Alternative Wrestling Show's "Number Three: The Women's Tournament" on September 28th: LuFisto vs Christina Von Eerie(c)/ Hudson Envy vs Lacey Ryan/ Marti Daniels vs tabitha Jackson/ Candice LeRae vs TBA/ Kurai Hime vs Raze/ Claudia del Solis vs Sierra Rose/ Mariah Moreno vs Crystal White/ Kitana Vera vs Britanny WOnder/ Michele Morgan vs Katarina Leigh/ Gold Digger, Sage Sin. ►Bombshell Ladies of Wrestling on September 28th: La Rosa Negra(c) & Amazing Kong vs Missy Sampson & Annie Social/ Riot vs Angelina Love/ Veda Scott & Mistress Belmont vs Jessie Kaye & Alexxis Nevaeh/ Amber & Craig Steele vs Silvie Silver & Lucifer Darkside/ Vanity vs Luscious Latasha/ Amber Rodriguez vs Jennifer Cruz/ Amy Lee vs Sumie Sakai. ►Absolute Intense Wrestling's "Girls Night Out 9-10" on October 6th: Allysin Kay(c) vs Veda Scott, Taeler Hendrix, Jewells Malone, Jenny Rose, Melanie Cruise, Mickie Knuckles, Seleziya Sparx, Nikki Storm, Mia Yim, Angelus Layne, Jodi D'Milo, Sassy Stephie, Annie Social, Heidi Lovelace, Jasmin, Nikki St. John, Sammy Geodollno, Angel Dust, Xandra Bale. ►SHIMMER Women Athletes Volumes 58-61 on October 19-20th: Cheerleader Melissa(c), Tomoka Nakagawa(c), Kellie Skater(c), Madison Eagles.